Situated in northern part of the country, the capital of both Punjab and Haryana, Chandigarh is an amazing place that calls for a holiday throughout the year. The city derive its name from Chandi ‘the main deity of Chandika Temple’. This beautiful city lies in the valley surrounded by Shiwalik hills. It is a gateway to famous hill resorts like Shimla, Manali, Kullu, Dalhousie and Dharamashala. Perfectly designed by world famous French architect Le Corbusier, Chandigarh is the most modern city in the country. The cool ambience of Sukhna lake and the pollution free environment attracts tourists from all over the world mainly for fun. Major Tourist Attractions in Chandigarh: The Secretariat, Zakir Hussain Rose Garden, Rock Garden, Sukhna Lake, Pinjore Gardens, Leisure Valley etc. Being the largest building in capital complex, The Secretariat is the headquarters of both Haryana and Punjab governments. It houses all the ministries. Both Legislative Assembly and The Secretariat buildings are situated in Sector 1. Spread out over 30 acres of land, Chandigarh’s Rose garden is Asia’s largest Gulab Baag (Rose Garden). Since 1967, today about 50000 Rose trees of 1600 different species are grown here. Apart from roses, the other trees planted here are of medical importance. To enhance the beauty of garden some unique specimens were also planted. This garden is situated next to the city centre. 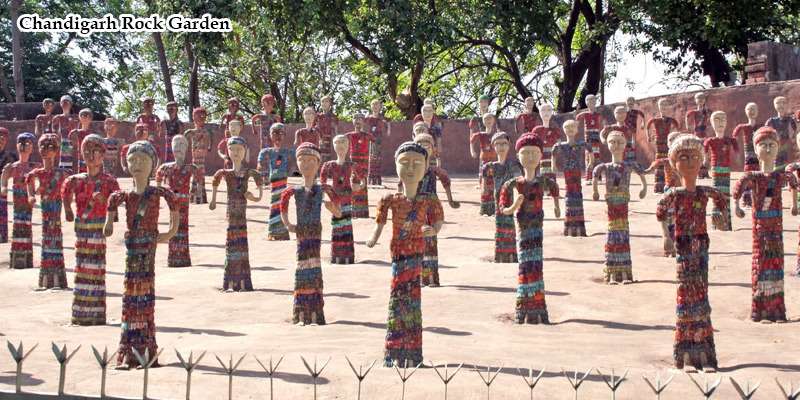 Nek Chand, an inspector in the engineering department created the rock garden by recycling of waste material and by putting together the fossils of ancient forms found in Shivalik hills. Rock fossils which have been converted into sculptures includes a wall made out of discarded fluorescent tubes, broken chinaware soldiers, an army of clay monkeys and shapes of women made out of discarded glass bangles. It spreads over an area of 6 acres. Spreads over an area of 3 km square, Sukhna lake is an important tourist attraction in Chandigarh. This lake also attracts migratory birds from Siberia during winters. Considered as a place for peace and tranquility, this lake attracts nature lovers from all parts of the world. Pinjore Garden, located at a short distance from Chandigarh is a traditional Mughal style garden. Considered as a favorite picnic spot for the tourists, it is open on all days. Leisure valley is formed by the combination of Nullah and the adjoining land. Staring from Rajendra Park in sector 1, the leisure valley extends into Bougainvillea garden in Sector 3 and crosses over into Sector 16. Pedestrians walking in the park remains undisturbed from the vehicular traffic. Situated at a distance of 5 kms from Chandigarh on the Chandigarh Patiala Road, Chattbir Zoo is a full fledged zoological park which houses hundreds of different mammals, birds and reptiles. Tourists are taken on the adventurous trip to the park and if you are lucky enough you will be able to see Royal Bengal Tiger – The pride of Chattbir Zoo. This is a best place for bird watching as well. Constructed along the bank of river Satluj, Bhakra Nangal dam is the world’s highest straight gravity dam. The hydroelectric station here not only generates power for Chandigarh but also for Delhi and other cities. Tourists can also enjoy boating facilities. Situated in Bilaspur village, Mansa Devi Mandir of Chandigarh reflects the symbol of Himalayan culture and belief. The people here worship the Goddess of Shakti. October to March is considered as the best season. By Air - Chandigarh is well connected by major cities like Delhi, Jammu, Srinagar and Leh by means of regular flights operating between them. By Rail - Chandigarh is well connected to other major cities like Bombay, Delhi and Kalka by means of superfast trains. By Road - Chandigarh is well connected by good network of roads with Delhi at a distance of 248 kms, Amritsar at a distance of 240 kms, Manali at a distance of 312 kms and Shimla at a distance of 117 kms.